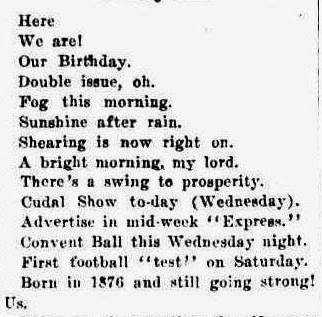 Nancy leathem's Trees and Branches: Molong Express - OUR PAPER.1933. Fifty-seven years ago to-day, in a little shed in Riddel Street, opposite where Mrs. Hasemere's store now stands, the first number of the 'Molong Express' was published by Mr. H. V. Leathem, father of the present generation of newspaper men of that name. Many and varied changes have come to our old town since Cobb and Co.'s coach brought Mr. Leathem here from his home in Gundagai, and through them all the history of the 'Express' has been an integral part of the history of Molong has left its mark upon it, for in every fight the paper has fought for that which it believed to be right, and in the best interests of the town and district, and can proudly claim today that it has never shirked a duty or accepted a bribe. Throughout the long drawn out battle for direct railway communication with the city, the sturdy old pioneer, who came to Molong in a coach, spared neither time nor money in the endeavour to provide improved means of transport for those who came after him, and it was largely a result of his enthusiastic advocacy of this particular route that finally placed Molong on the railway map of New South Wales. Many years later, when a second newspaper had been established, and its proprietor, the late J. C. L. Fitzpatrick, of revered memory, sought political honor, the 'Express' stood solidly behind him, trade rival though he was, and left no stone unturned to secure his return 'to Parliament, realising that the interests of the district, always first with the paper, would also be first with him. How true that vision of devoted service was the years that have passed bear witness. The hurrying march of events that has touched our district, moving one well-known figure here, and placing another there, like pawns in a game of chess, has brought changes to the ' Express' also, and though Mr. Charles Leathem is still to be seen in the windy doorway, with a smile and a joke for his innumerable friends, under his regime the old plant has been enlarged and modernised, the hand press having been replaced by a faster machine, electrically driven, and instead of the tedious old process of hand setting the type, a modern linotype machine eats up the copy, and, like Oliver Twist, still asks for more. During the war period, when soaring prices and scarcity of material made publication difficult, the management stoutly refused to consider a suggested increase in the price of the paper, and later, though hard hit by the prevailing depression, battled on, and now, feeling the throb and lift of returning prosperity and encouraged by a gratifying increase in its number of subscribers, has decided to extend the scope of its operations to embrace a bi-weekly publication.